This post marks my final installment of the life of my dog, Oreo and wraps up the three-part Writing 101 assignment, Serially Lost. To catch up, please read the prequel about Oreo and the story of I Lost My Oreo. Oreo’s life went on as it does for any dog. Oreo spent long days in the backyard. He was an outside dog. He had a large backyard with plenty of space to run and neighbor dogs to keep each other company behind their respective fences. I worried about him being alone so much. I know most dogs sleep all day, but I made sure to take him for walks as often as possible. Oreo was the best watchdog I ever had. At about 65 pounds, he had a deep, throaty bark that no doubt scared potential intruders. And he only barked when he needed to. During the winter holidays when the family was inside, gathered in the living room, Oreo would get our attention by touching his front paw against the slider door as if to say, “Hey, I’m here!” Of course we would all laugh and go pet him. Many times, my brother brought his dog, Ginger, and the two would tumble and chase all over the backyard. Ginger is with Oreo now at the Rainbow Bridge. When I started grad school, Oreo was 10 years old. With one daughter on her own and the other busy with school and sports, Oreo and I would take long walks every evening. He was always so happy to go for these walks while I pondered school readings and looming assignments. In 2009 when I met my husband, and we started spending summers at the delta, Oreo went with us every weekend. By now he was 12 years old and dogs his size usually only live to that age; and his age was beginning to show. He was becoming hard-of-hearing and his eyes had the unmistakable cloudiness of glaucoma. Once my hubby came into our lives, Oreo spent much less time alone. My husband got home from work earlier than me and he would sit on our deck and enjoy a beer. He loved to give Oreo a tiny saucer of beer once in a while. In his older age, Oreo developed a funny little habit of moaning and groaning with pleasure when we would bend down to hug him and pet him. The sweet, throaty noises he made gladdened my heart to know he was truly happy. My eyes tear up even now as I remember this. In 2010, we had the opportunity to get another dog, this one a puppy. My daughter pointed out that all our pets’ names had the letters “E-O” in them: Leon (the cat); Gideon (my daughter’s dog); and, of course, Oreo. See the pattern here? Trying to name the tiny brown Spaniel-terrier mix was a challenge, what with putting E-O together. My hubby came up with Aero. So, yes, calling for Aero and Oreo was tongue-tying! Finally we gave up and just yelled, “Air-ee-yo” and they would both come running! Oreo and Aero kept each other company for the next 10 months. 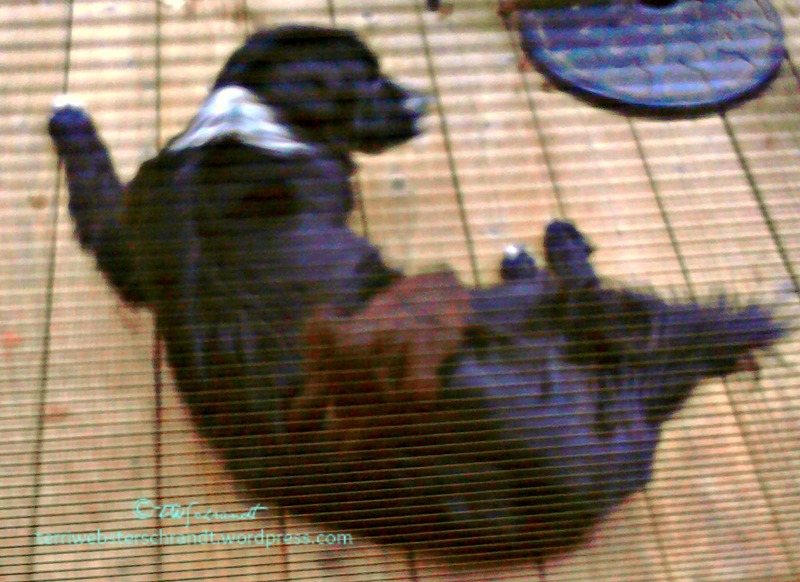 In this photo, taken from behind the screen door, you can see Aero lying on top of Oreo all snuggled up. I was so lucky to capture that moment and will never forget how good Oreo was with having an annoying puppy around. When both dogs were at the delta with us, part of the morning routine was to take them out for their morning relief. One particularly windy morning, as I walked along the levee road, I spotted Oreo and Aero running alongside the pink stucco wall that marked the barrier between the two campgrounds. Worried that Oreo would continue running up onto the road, I yelled for both dogs. I was nearly 200 yards away so my voice went nowhere. A moment later, with the strong wind at my back blowing toward the dogs, suddenly Oreo stopped, sniffed the air and turned to look straight at me. I was amazed at how strong his sense of smell was, and realized that his blindness and lack of hearing would not deter him from enjoying his last few months. We believe the attention, a puppy companion, and fresh, breezy air added two years to Oreo’s 14-year life. As humans, we will always outlive our fur-babies. Pets will enter and exit our lives and we will always cherish their sweet memories. I love the poem of the Rainbow Bridge and I get comfort believing that our beloved pets occupy a special place in Heaven with the rest of God’s creatures. While I write this story, Aero (now 5 years old) has been leaning next to me as if he understands my emotional state. Dogs are amazing. I hope you enjoyed reading and I thank you for indulging my memories of Oreo’s life journey. If you have a fur-baby at home, whom you know loves you unconditionally, please give it an extra-special squeeze today. Today’s Prompt: For inspiration, ponder the phrase “lost and found.” On day four, you wrote about losing something. On day thirteen, you then wrote about finding something. So, today’s twist: If you’d like to continue our serial challenge, also reflect on the theme of lost and found more generally in this post. I am also including this post for BeWOW Wednesday, a weekly challenge from Ronovan Writes. Thanks for posting your dog’s story on Throwback Thursday. I’m a dog person too! What a great dog, Terri. I love the picture of both the dogs together. Our 7 year old boxer is a sweetie too, tolerating all the pranks and bullying from our 6 month old adopted Indipup! Dogs have such a special way of carving out a unique place in our hearts. Thanks, Corinne! They do leave an indelible mark on our souls! Aww what a beautiful dog! Sounds like he had a great life & was a good dog. Love the naming pattern of your pets! Dogs add so much to our lives. I can not even fathom losing my Riley. I do think about it, as if to prepare myself. He just turned 9 and is the love of my life. Your story touched me deeply. Thank you, Carol, I’m glad it resonated with you. We dog lovers do indeed love our pooches! Once more you wrote a beautiful post for and about Oreo. No shortage of love, warmth and care! Oreo was an an amazing friend. Thank you for sharing his life! Thanks, too, for finding and following my blog! Love your blog posts about Oreo! Losing a pet is hard, but knowing that they are in our hearts forever and their memory lives on is a great feeling. I loved reading the story of Oreo Terri! You captured a beautiful shot of him! (In photography and in words). Oh, thank you , PJ. Sadly I did not have as many photos of him as I should have. But that one seems to epitomize Owee-o (as we called him). I wish I had gotten some good pictures of my Princeton. I know what you mean, but at least you have one good one, I don’t even have one good one. We will never forget our pets. I lost my first dog in the Netherlands couple years ago and I still remember him until now. The poem is so beautiful, and maybe now Oreo and Moby (my dog) are playing together at Rainbow Bridge 🙂 Best wishes, and thank you for sharing lovely tribute of Oreo. I’m so sorry for your loss! I like that idea that Oreo and Moby and others are playing at the Rainbow Bridge. Thank you for your lovely comment!